When I think about my favourite birthday party treats growing up, Jelly Slice is ALWAYS high up on the list and I promise you this is the BEST Jelly Slice Recipe you will ever make! After all what is there not to love about it when you’ve got a yummy buttery base, tangy cheesecake filling and then the sweet jelly topping – yum! 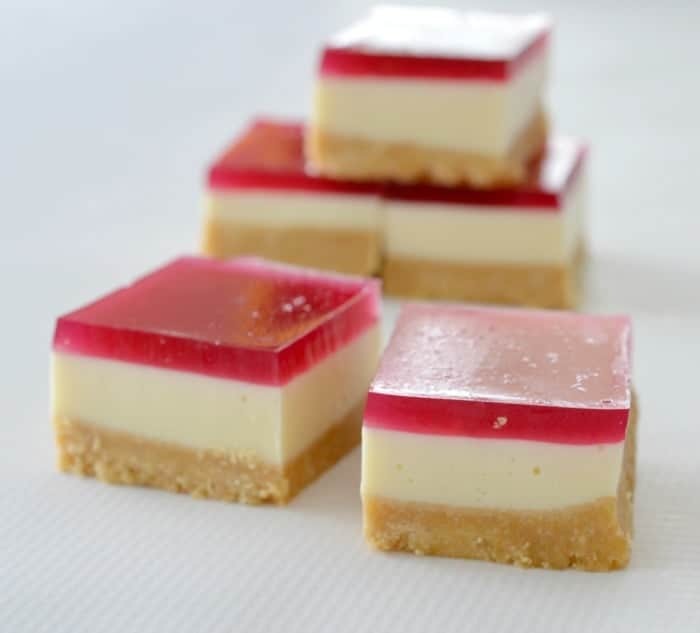 I’ve made a few versions of Jelly Slice in the past including this Strawberry Jelly Slice and my Christmas Jelly Slice, but I have to admit this traditional Jelly Slice recipe is my favourite – a big call I know! I can remember being a little nervous the first time I attempted it as the thought of creating three perfect layers was a little intimidating. However I PROMISE you that this is really easy to achieve and not only does it look great, but it tastes amazing as well. 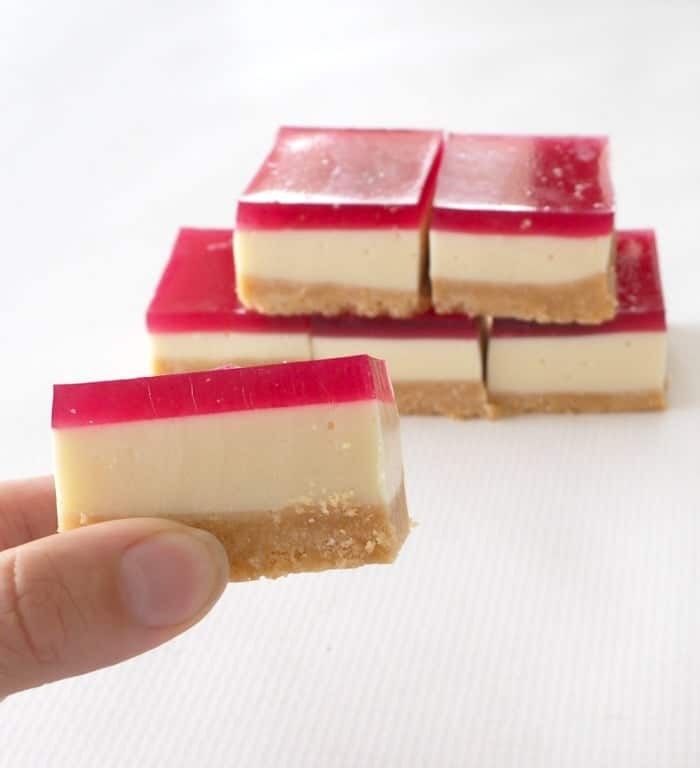 The secret to achieving perfect layers with your Jelly Slice, is to make sure you let the cheesecake layer cool in the fridge and begin to set before pouring the COOLED jelly over the top. 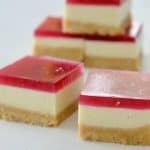 If you try and pour jelly which is still a little warm over the cheesecake layer which hasn’t chilled for long enough you are going to end up with ‘holes’ filled with jelly in your slice – this doesn’t change the taste but can be an issue when you try to cut it into neat little squares. I also suggest you place the tin you are making your Jelly Slice in, onto a baking tray before you add the jelly. This will make is a whole lot easier to transfer into the fridge. You can use any brand of Jelly to make this recipe, just follow the instructions on the back of the pack and add the extra gelatine to it as per the recipe instructions below. While I’m all for sticking with the classics, you REALLY need to also try this Christmas Jelly Slice recipe (Thermomix instructions also included) – how fun does it look?! 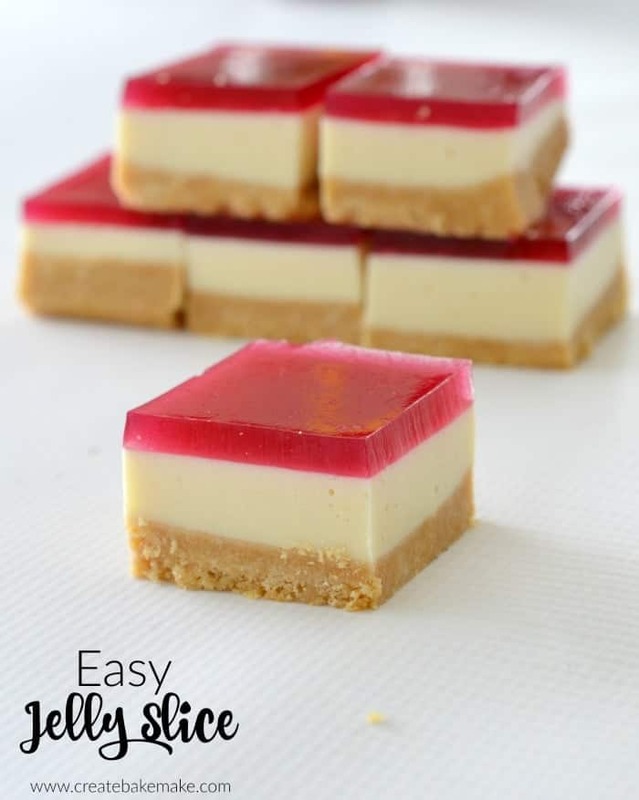 For more slice recipes like this Jelly Slice, make sure you grab your copy of our Thermomix Slices book (Also available in a bundle pack)- plus it has FREE postage on Australian orders! This really is the best Jelly Slice recipe you will ever make - I promise! Both regular and Thermomix instructions are included. Line the base and the sides of a slice tin with baking paper, making sure you leave plenty hanging over the sides. Crush the biscuits until they resemble fine breadcrumbs. You can use a rolling pin or food processor. Add the melted butter to the crushed biscuits and mix until combined. Pour the mixture into the lined slice tine and press down with the back of a metal spoon and place in the fridge to chill. In the meantime, add 2 1/12 teaspoons of gelatine to 3/4 of a cup of boiling water and stir until it has dissolved. Place the condensed milk into a bowl and while whisking, add the dissolved gelatine mixture and the lemon juice. Continue to whisk until mixture is smooth and has combined. While the slice is chilling, you can make the strawberry jelly as per the packet instructions – adding an extra teaspoon of gelatine. Allow the jelly to cool until it has reached room temperature. Remove the slice from the fridge and carefully pour the jelly over the slice and place it back in the fridge to completely set approximately 6 hours – overnight is best. Remove the set slice from the fridge and using a hot knife, cut into squares. If it's possible, leave this slice to set overnight before cutting. Use a sharp knife to help cut through the layers easily. Place the biscuits in the bowl and crush for 5 seconds on speed 9. Add the butter and heat for 3 minutes on 80 degrees speed 2. Remove biscuit mixture from the bowl and pour into the lined tray. Push the mixture down with a metal spoon to create a flat surface. Place in the fridge for 30 minutes to set. To make the filling, combine the gelatine in a jug with the boiling water and allow to cool slightly. In a clean bowl, add the lemon juice and condensed milk and mix for 45 seconds on speed 4. After 5 seconds, remove the measuring cup and carefully pour the gelatine mixture in. Remove the set slice base from the fridge and pour over the filling. Put back into the fridge for 30 minutes. In a clean Thermomix bowl, add the hot water and heat for 3 minutes on 90 degrees speed 2. Add the jelly crystals and one extra teaspoon of gelatine and stir until they have dissolved. Pour jelly into another bowl and allow it to cool until it has reached room temperature. Remove the slice from the fridge and carefully pour the jelly over the slice and place it back in the fridge to set for approximately 4 hours – overnight is best. Remove the set slice from the fridge and cut into squares. Love Slice Recipes? 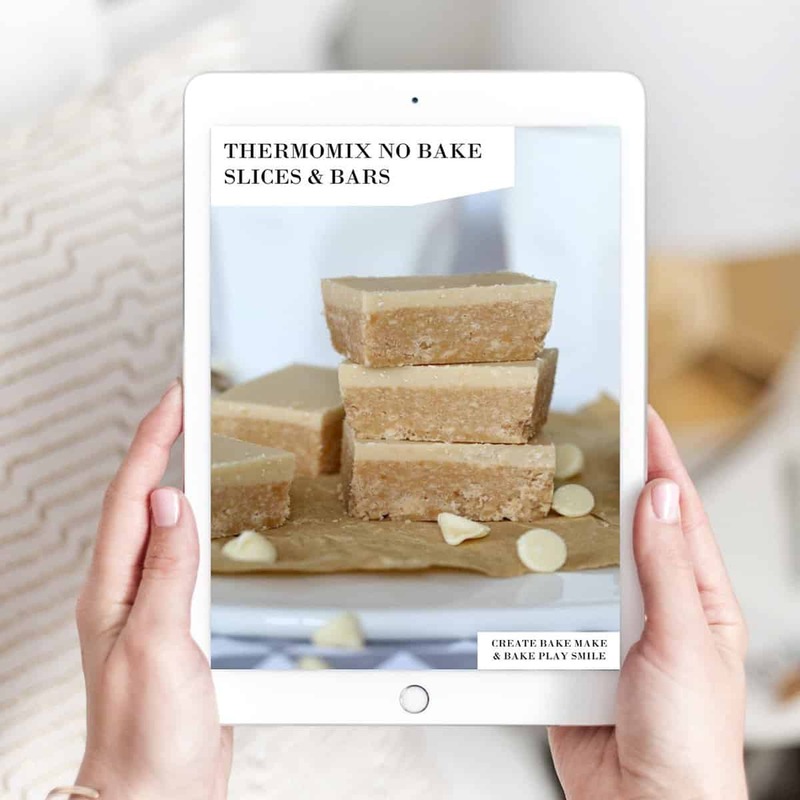 Here is a collection of my favourite slice recipes that can be made both regularly and in a Thermomix!! Loved it. Now I know the technique with the setting and cooling, I can’t wait to give it a go. Thanks lovely, I can’t believe she is 1 already! I think all Nans have the BEST recipes! What size tray do you use? Hi, l made this jelly slice twice. When I prepared the jelly as directed, jelly was settled down while cooling. So I couldn’t pour the jelly or if I pour the hot boiling jelly over the condensed milk, it doesn’t stuck with it. Do you have any solutions. Please let me know. Thanks. I keep stirring the jelly as it cools down to help stop it setting. If you find it’s starting to set, try adding it to the slice. I find the best way to describe the point where the jelly is ready to pour over the white layer is when it has “egg white” consustency. Hi Kathleen, hmm could you try just a traditional lemon cheesecake recipe for the filling? Hi. My 2nd layer was cooled down and the jeĺly was at room temperaturw and getting firm. So i had to bump the form to cover everything with the jelly. I thought i had waited too long. But after a night in the freezer the jelly was almost liquid. I coyld poor it out of the tin. I reheated it, let it cool down till it started to become stiff, But after a few hours in the tin the same problem, watery jelly, What has gone wrong? Hi Tiarni, I usually get around 20 – 24 pieces. I have made this for years and when going to parties and taking a plate I make them as small cupcake sized. Same recipe just make individual slices in cupcake tin. I get about 16. Young and old love them. The only difference from your recipe is you make up jelly with one cup of water. I just wait till cool enough to pour over. Hi Joy, No I’m sorry this recipe isn’t freezer friendly. The jelly layer doesn’t freeze well. I made this a few weeks back for my sister’s burthday and plan on making it again for Christmas. Lovely, simple recipe. Thank you for sharing! Oh thanks so much Michelle, I’m so glad you enjoy it. Merry Christmas! 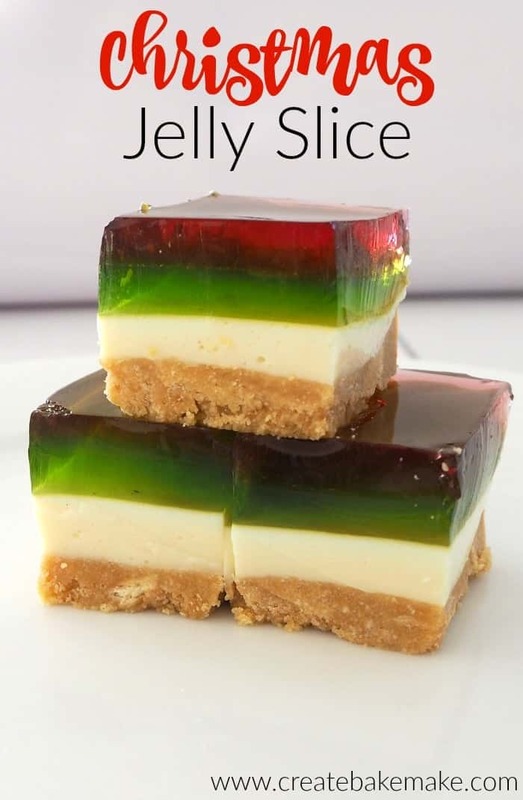 I have been eating everyone else’s jelly slice for years so I decided to make my own for the first jelly slice and the second layer layer will not set (condensed milk and gelatine) not sure why, it still tastes yummy. Hello! I see the recipe calls for condensed milk. Is this the same as sweetened condensed milk, and if not, what will make the white layer sweet? I made this. Had a craving as ate it during my childhood. It was ok but bit of a flop because I didn’t know what size tray to use. I tried to use a size that looked appropriate for a slice but yours must be smaller as mine didn’t turn out with such a thick layer of mixture it was more thinly distributed. Served it to guests in a cup with ice cream x2 layers so it was like a trifle. I made this today fir the first time everything was fine except the jelly does not stay on top of the cake it’s sliding off. What’s gone wrong. My base was quite soft and not crunchy, any idea how I can fix this? Good afternoon. I have made this jelly and it turned out just like my mums! I’m just wondering how long it can stay in the fridge before it should all be eaten.